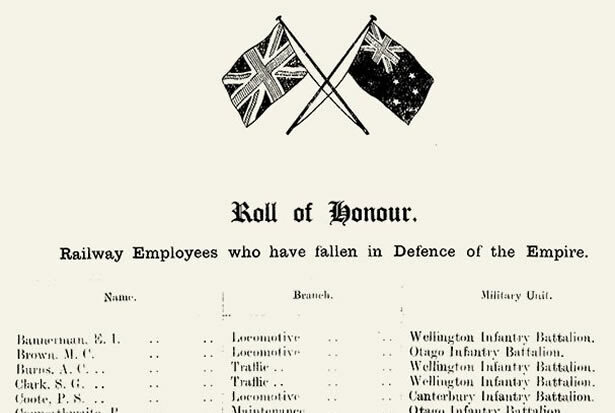 Following the First World War New Zealand Railways, the Post and Telegraph Department and core Public Service departments published rolls of honour in the Appendices to the House of Representatives or the New Zealand Gazette. Casualties among members of the education service were published as an appendix to the Minister of Education’s annual report in the Appendices to the House of Representatives. Education personnel employed directly by the Education Department were also named in the public service list printed in the New Zealand Gazette. Teachers, apart from those in Native Schools, were employed by regional education boards. We have transcribed these rolls and linked each name to that soldier's page on Auckland War Memorial Museum's Cenotaph database. From this database you can also find links to the full service records for each soldier on Archives New Zealand's website. Some of the trade unions representing government employees used their own journals to publish obituaries of staff who died during the war. Here you can find transcribed obituaries of staff from New Zealand Railways, the Post and Telegraph Department and the core Public Service departments. We have 25 biographies, 40 articles, 1 comment related to Rolls of honour and obituaries. I know will make it my duty to. Keep his memory alive. Thank you Michael.and all the other men, who died for us.